The first time I saw Andrew Zimmern in the town of Otavalo, I knew I had to visit someday. So, someday is someday today. One of the reasons for its charm is the almost totally indigenous population of 90,000 natives. Locals, called Otavaenos, are best known for weaving textiles from mostly wool. They are sold at the famous Saturday market. But it is Wednesday! 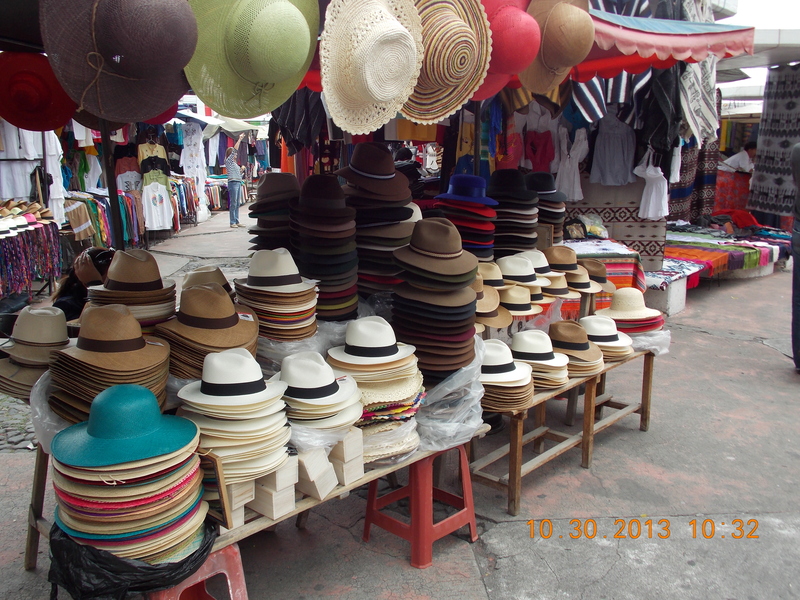 The famous Otavalo Market consists of ninety whimsically shaped (like a mushroom) umbrellas with benches. They were designed and built by the Dutch architect, Tonny Zwollo in 1970. On the peak market Saturdays, the market is flooded with goods such as clothing, tagua nut jewelry, musical instruments, spices, dream catchers, leather goods, purses, fake shrunken heads, costumes, platters and trays, raw food and spools of wool. But, contrary to popular belief, tourism transformed the economy from farming. 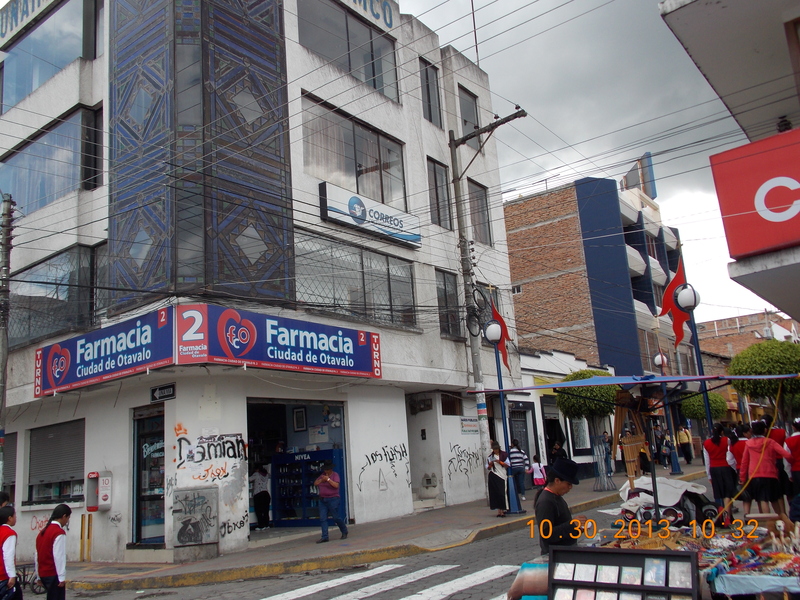 Most visitors to Ecuador stop here to buy handicrafts. The main street is now inundated with hotels, hostels, and tour operators. 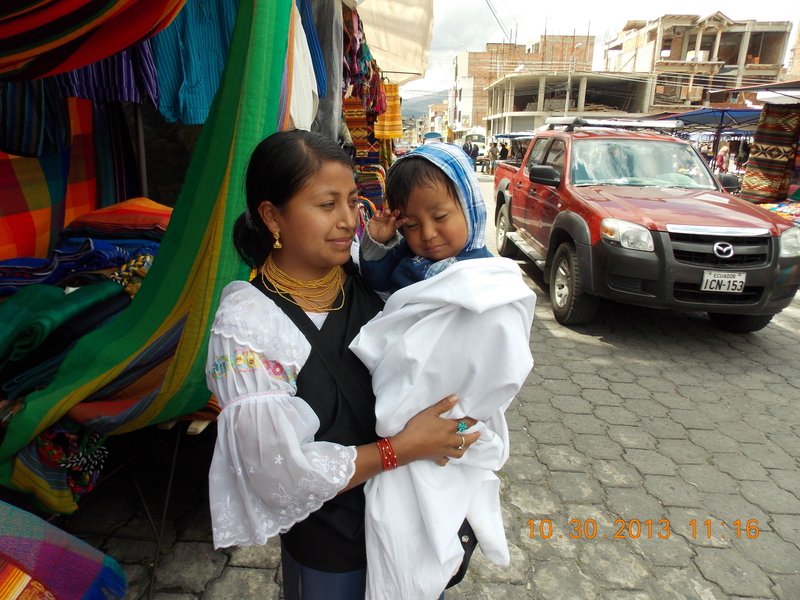 Nevertheless, the indigenous population is considered the most successful in all of Latin America. The local women are well-known for wearing their distinctive white embroidered blouses, with flared lace sleeves with black or dark over skirts. I noticed that their long hair is tied by 3 centimeter bands of colorful woven material. Most often, it matches the waist band of the same color and design. It was a two hour trip up here from Quito, along the famous Pan American Highway. You may recall, Mike and I started in Chile a few years back where this famous highway begins. The bus ride carries the enormous price tag of $2 USD. Once here, the best part is the $1 taxi ride, anywhere in town. We hired a driver and auto for the three of us, at considerably more. The largest food market is the Mercado 24 de Mayo. But more fun is the tiny organic market, Feria Imbabio. Here, indigenous women from nearby towns and villages sell traditional dishes and organic fruit and vegetables picked that morning. In other words, fresh! Though not for us, there is a live animal market on the northwest edge of town called the Mercado de Animales. The streets are filled with their traditional brand of music, though I can hear an occasional Perry Como, Ray Coniff Singers, or Dean Martin (just kidding!). During the summer, the musicians gather for an indigenous festival for the summer solstice, called Inti Raymi. I think it is called the same in Peru. Many musicians are touring the world in what is now called Andean New Age music. We bought some alpaca items from a local lady named Anita. Mike drives a hard bargain. Then, after he was done, and saw her three young children, just gave her $5 to buy something for her kids. They loved him! All of the cute, local school children wear uniforms, and generally get out of school by noon or shortly thereafter. They go home, and are joined by their parents for the largest meal of the day. Quite a nice tradition. Oh, and the kids are so well-behaved! Education is valued highly here, and the schools are of very good quality. It was nice to get out of the city, though the roads outside of town are much better than city streets. Their strong economy, read that oil, allows for great investment in the infrastructure of the country. Our driver is actually a fellow from Toronto, married to a Venezuelan beauty, living here now for two years. He had a nice Mazda crossover, brought from Canada, and was a safe driver with great built-in GPS in his brain. We also found out that interest on car loans runs 8%. People value their cars here and keep them in good repair. Many Americans move here, since the cost of living is so low. Americans are granted immediate residency. Upon reaching age 65, both property taxes, and utility bills are cut in half! No wonder there are so many gringos here! Among the many things we did was stop at the Equator. We learned quite a bit, enough for a separate email. And we also stopped for some biscocho and coffee on the way home. Jaime was quite nice, and provided a nice friendly banter with the three Musketeers (Gerry, Mike, and Barry the V). We only had one beer at lunch, along with a small sandwich and fries. All in all, a nice day was had by all. ← How About a Driver in Quito?